Happy Bourbon Day Queen City Drinkers! What’s this you say? You’ve never heard of Bourbon Day before? I suppose this means you didn’t get me anything either? That’s OK, I’m disgusted at how commercial the holiday has become anyway. Remember, Elijah Craig is the reason for the season. Yes legend, or perhaps just a good marketing department, has it that in 1789 on this date, June 14, Baptist minister Elijah Craig first invented bourbon by aging his whiskey in a charred oak barrel before sending it down to New Orleans where it became a hit. Although this story is likely apocryphal, that isn’t going to stop me from celebrating. For today’s cocktail I recommend a classic bourbon cocktail, the horse’s neck. I first made this drink for Episode 41 of The Charlie Tonic Hour. Charlie and I talked about our trip to the Old Kentucky Bourbon Bar where, in addition to sampling a nice selection of rye and bourbon whiskey, I also tried a classic bourbon cocktail. The Horse’s Neck cocktail dates back to at least the 1890’s when it was more typically made with brandy. Today it is most associated with bourbon and has a history within the Navy as a typical officer’s drink. It gets its name from the garnish, a long peel of lemon that hangs over the glass. I love ginger and bourbon so this was a great drink for me. Make it with the bourbon we featured in the show, Ancient Age 10 Year, and you won’t be disappointed. 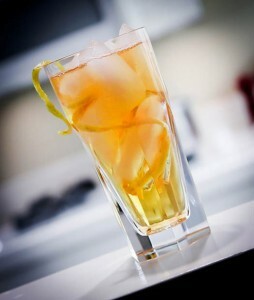 Carefully peel a long sliver of lemon zest and arrange it in a highball glass and add ice. Add the bourbon and bitters, top with ginger ale and stir.